I needed a side dish to bring to a party and had all these cute little eggplants from the farmer’s market. “What to do with them?” I thought. Well I figured making an Asian inspired dish would fit the bill, and I would feel good about bringing a healthy dish. The eggplant is a nutritional winner. Low in calories and fat, rich in fiber, it has a low glycemic index, contains many essential vitamins and minerals and is high in antioxidants. These properties are effective in helping to control cholesterol , sodium and the inflammatory processes that are harmful to our bodies. And now, the recipe . . . . . .
Use the long, skinny, baby eggplants. I used the purple and white striped variety, but any color will do. You do need the thin, baby variety however, as they have no seeds and are ore tender than the mature types. Mix the soy sauce, sherry, sesame oil, pepper flakes, garlic, and black pepper and pour into a large , flat pan (a foil-lined cookie sheet is good). Place the eggplant halves in a single layer, into the pan, cut side down. Let them marinate for half an hour on the counter. Preheat the oven to 375 degrees for a convection oven, or 400 for traditional oven. After half an hour of marinating, pour off the excess marinade into a bowl and set aside. Place the eggplant pieces into the oven and roast for 10 minutes. Turn the eggplant over, cut side up, brush with some leftover marinade and roast for an additional 10 minutes. 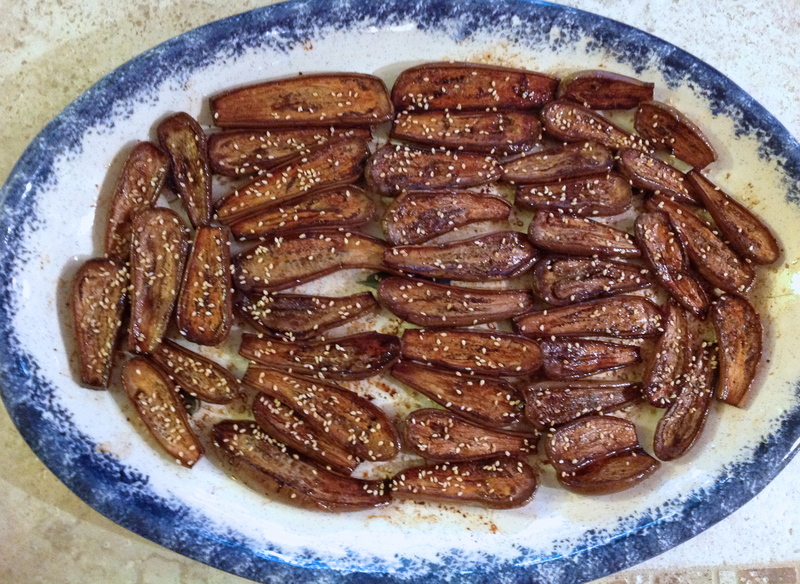 Remove the eggplant from the oven and sprinkle roasted sesame seeds on top. This can be served hot or at room temperature. You can also grill them on the barbecue, but use one of those mesh grill pans or the delicate eggplant will get too mushy and fall through the grates of the grill. Cook on lower heat and for less time than in the oven. Technically a fruit, we use tomatoes more like a vegetable. Tomatoes are SO healthy! They have no fat or cholesterol, very few calories, sugar and sodium, yet pack a lot of flavor and nutrients. They have a good dose of Vitamins A, C, K, folate and choline, and minerals calcium, magnesium, phosphorus and potassium. Their high antioxidant content makes them good cancer fighters as well, sweeping up all those free radicals we accumulate from other “bad” foods, particularly those with nitrates and nitrites, grilled foods, etc. Roasting tomatoes brings out the intense tomato flavor that is delicious with the right herbs and spices. I find the best complement to tomatoes are spices used frequently in Italian cooking: parsley, oregano and basil. Because they will bake and absorb the seasonings, you can happily use dried herbs, but feel free to use fresh if you want to. I use many kinds of tomatoes, but the juicier varieties are the best. Roma tomatoes are nice, but tricky to stand in the baking dish due to their shape. Slice lengthwise if using this variety. Here is the simple recipe. Enjoy. Discard the stem. Slice tomatoes in half and line up on a lightly oiled baking dish. 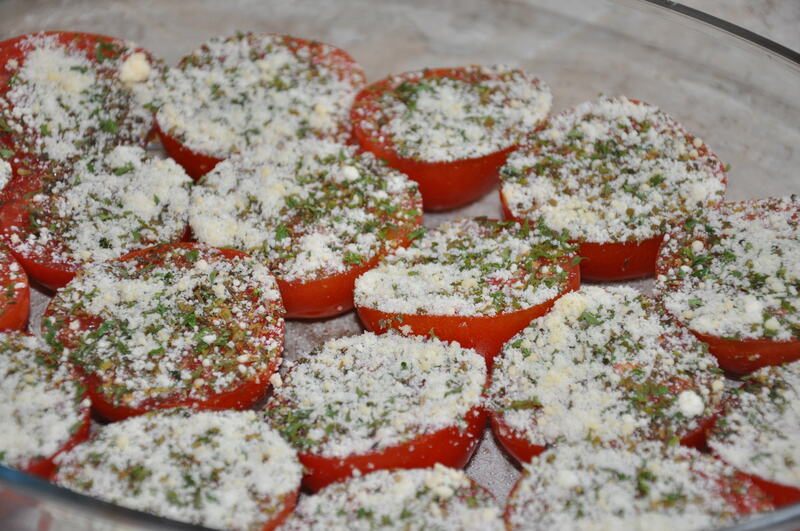 Sprinkle the tomatoes with dried oregano, basil and parsley (equal amounts of each) and a dusting of salt if you like, though it is not necessary if you are minding your sodium intake. You can also sprinkle with grated parmesan or romano cheese (then don’t use the salt) and bake at 350 degrees. The length of time depends on the size of your tomatoes. For cherry tomatoes, 20 minutes will do. For medium to larger ones you will need at least 30 minutes, and up to 45 minutes. Remove and serve! Also good at room temperature, so you can make it a little ahead if you need the oven for other dishes.